Last Friday, I uploaded the 4 part "Frizzy Fro" series on my YouTube channel. Part 5 with the results was a damaged file and did not post to my page. I wanted to make sure you could see the results though and know exactly how I completed the look. First, after I finished twisting, I put on a cute scarf because I had to pick up my sister. The scarf was on for about 30 mins total. When I got back home, I took it right off and airdried for an hour. After that hour, I gently took apart the twists. I didn't comb them out, I left them chunky and super defined. I sprayed all around my edges only with water, and rubbed some KeraCare Edge Tamer all around my perimeter to give it a nice, glossy sheen and hold. I wore my hair around the house all evening before tying my hair up again at night. The next morning, I re-wet my edges again, but this time I used Mimosa Hair Honey to slick my wet edges back. I like the sheen it gave my hair. I didn't like this product originally, but it is slowly growing on me. It does contain beeswax, so I may end up putting it back under the sink where all of my unwanted products are. I don't know how my hair will respond to beeswax over time, I'm monitoring for now. Hey Ive been watching your videos on youtube and now im following your site here. I love the videos and honesty and most of all realness of what your doing. Im thinking about going natural too cause my hair is really damaged. You mentioned you had very good protective hair styles. 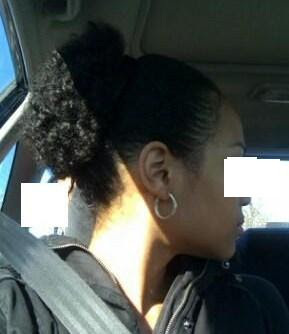 What does that mean when say protective hair style ? and what type of style did u use ? Hey Mylinda !!! Thanks girl !! I'm going to be making my way back to KISS really soon =) It's been a few weeks since I've checked in over there. thank you SO MUCH !!! I'm trying so hard ..
"A protective style is where your ends are protected, shielded away, and invisible to outside elements i.e. weather (rain, snow, wind, sun etc.). These styles really help in retaining length. Some examples would include buns, braids, cornrows, wigs, weaves, lacefronts, french braids, up-dos, phony ponies etc. Low manipulation, basically means styling the hair with no direct heat. Braid outs, twist outs, bantu knots, pin curls, flexi rod sets, roller sets etc. are all under the category of low manipulation styles. These styles require no direct heat (blow dryer or flat iron) and barely any energy or skill on your part. They are easy to do and healthier style choices since direct heat is the quickest way to dry out the hair." my protective styles during my transition were sew-ins and half wigs ! I still wear wigs on occasion now when I want a drastic change. I had a great time trying different curly wigs on and since my hair was braided underneath, I was not touching my hair at all and I was able to retain length, while keeping my hair healthy by refraining from heat and combing (combing was something I only did on my wash days, it was a nightmare because of the two textures). Fabulous! I'm trying so hard in copying this style. Thankfully, my sister suggested that I should wear a wig that resembles this look. I trusted her so much about it since she's an avid fan of women's wigs, especially synthetic wigs.